Hi, I'm Clare, a thirty-something Vegetarian living with my family in Hertfordshire. I started writing "The Vegetarian Experience" in 2011, after a conversation with a fellow vegetarian friend, about how vegetarian food is perceived by others as boring, tasteless and bland. My blog has also evolved by my becoming a parent, as in recent years I have had to ensure my children are getting a healthy and balanced diet. I love to cook meals from scratch especially, so that I know what my kids are eating. My hubby and children aren’t completely vegetarian, but they mainly eat vegetarian food. I love using ingredients to create vegetarian dishes and often adapt meaty recipes using soya substitutes. Since I started writing this website, I have been thrust into the world of vegetarian food, and blogging. I have found myself undertaking vegetarian recipe development, reviewing vegetarian food for the retail and restaurant industry, attending courses on cooking food, food writing and food photography, and advancing my own skills, both writing, and in the kitchen! I work part time in Antenatal Education, and I also work freelance in marketing, PR, social media, copywriting and event management. I am also a mum to two young children. In my "spare" time, I do voluntary work for various different local organisations and raise funds for local charities. This blog is somewhere to chat about vegetarian food, share vegetarian recipes, point out new vegetarian products and review the vegetarian menu of local restaurants. I also review products and post anything else I feel like posting! If you like what you are reading, then please subscribe, Thanks! 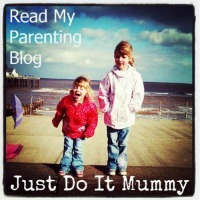 I also write over at Just Do It Mummy - which is my parenting blog where you can find all things non-foodie related!